Big Buck's moved another step closer to jumping immortality with a faultless display in the Lough Derg Long Walk Hurdle at Ascot. Victory in the Grade One event was the 14th on the bounce for the Paul Nicholls-trained superstar, moving him one ahead of Bula as he closes in on Sir Ken's record of 16 set in the 1950s. Young pretender Dynaste set out to test the 3-10 favourite from the front, and for a brief moment going to three out Ruby Walsh had to niggle Big Buck's along, but normal service was soon resumed rounding the home turn and the champion stayer jumped two out in front and sauntered clear to win by eight lengths. The exertions in taking Big Buck's on took a toll on Dynaste, who weakened as Five Dream and Restless Harry took the minor honours. 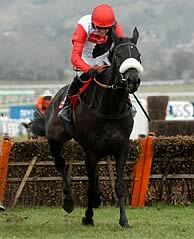 Nicholls said: "He's all class. He looked fat at Newbury and I thought he was a lot fitter today. He's such a character and you've really got to manage him. But he was really good today and I hope he will continue to be hard to beat. "We'll have to see, but I wouldn't have thought he would run again until Cheltenham. He won't ever go over fences now, he doesn't like them and he is too good at that job." 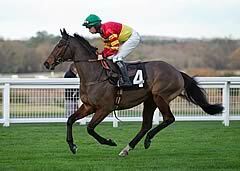 Walsh added: "He's an incredible stayer with loads of pace. He's just a very good horse. He's maturing and growing up. Going right-handed wasn't an issue. It might have been a few years ago, but now now. He's incredible." Nicholls was also responsible for Five Dream, and said: "I thought he was going to run a good race on his last run and he will go for the Cleeve Hurdle now." David Pipe said of fourth home Dynaste, who was stepping up markedly in class after a facile Haydock win: "It was a good run, but that was graded company. We will have to sit down and have a think about where he goes next."